Lola May Harvey was born on 4 May 1883. She married Daniel Frederick Nauth, son of George Nauth and Phoebe Lite, on 23 September 1907 in Rockford, Winnebago County, Illinois, or the 24th. Daniel Frederick Nauth became a widower at her death. 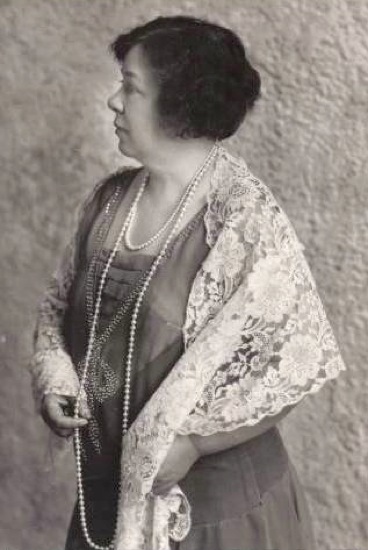 Lola May Harvey died on 3 October 1955 at age 72. She was interred at Keil Cemetery, Keil, Manitowoc County, Wisconsin. The following appeared on circa 5 October 1955 in a local newspaper: Mrs. Daniel F. Nauth, 72, died at Memorial hospital in Sheboygan about 7:00 a. m. Monday. She had been hospitalized for about a week. Her death was attributed to a heart attack. /P/ Funeral services for Mrs. Nauth will be held this Thursday afternoon, from St. Peters Evangelical and Reformed church, with Dr. E. L. Worthman in charge. Burial will be made in the Kiel cemetery. /P/ Mrs. Nauth was one of the citys foremost leaders in civic affairs over the past 20 years. She was very active in American Legion auxiliary circles. /P/ Mrs. Nauth, the former Lola Harvey, was born May 4, 1883, at Toulona, Illinois, a daughter of the late Mr. and Mrs. Rufus Harvey. She was graduated from Rockford, Illinois, high school, and Rockford college, and received her nurses training at City hospital, Rockford, Illinois. She was married to Dr. Nauth September 23, 1907, and the couple located at Kiel. /P/ Was State President. A charter member of the auxiliary of the Kasper-Bechle-Wilkens Post No. 99 of Kiel, American Legion, Mrs. Nauth served as its president and past president and also was president of the auxiliary district and the Wisconsin Legion auxiliary. Following her election to that office August 19, 1931, Mrs. Nauth was given a public reception by the citizens of Kiel. /P/ She later was national executive committee woman in the auxiliary and represented Wisconsin at national meeting. Early in 1933 Mrs. Nauth was one of nine state women appointed delegates from the American Legion auxiliary to the womens patriotic conference on national defense at Washington, D.C. /P/ Mrs. Nauth was a member and past president of the Daughters of the American Revolution, having three ancestors in the Revolutionary War. She served 15 years as president of the Kiel Municipal Band, which she was instrumental in reorganizing. /P/ Other organizations of which she was a member and past president include the Kiel Frauenverein, Dorcas society, and Study club. She served on the Kiel School Board and also was president. Mrs. Nauth was a member of the Womens Guild of the St. Peter Evangelical and Reformed church, and the Kiel Garden club. /P/ Active for Red Cross Mrs. Nauth directed Red Cross activities in Kiel during World War I and was county chairman of the thrift stamp drives as well as Sixth District committeewoman. /P/ Surviving in addition to the husband are a daughter, Mrs. Donald Widenfeller, Whitefish Bay; a brother, Guy Harvey, Corvallis, Oregon, and two grandchildren. A brother and sister preceded her in death. /P/ Friends may call at the Meiselwitz funeral home after two oclock Wednesday afternoon until 11 oclock Thursday morning, when the casket will be moved to the church, where the body will lie in state until the hour of service. /P/ The Citizens State Bank, of which Dr. D. F. Nauth is the president, will be closed Thursday afternoon because of Mrs. Nauths funeral services.